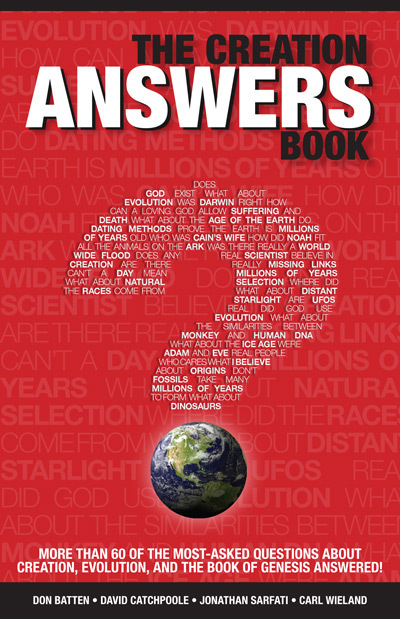 Is the evolutionary tree turning into a creationist orchard? Evolutionists often infer that all organisms are related based on similarities at the physiological and anatomical level and, more recently, on ribosomal RNA (rRNA) homology at the gene level. Eldredge has highlighted this in his statement: ‘ … the major prediction of evolutionary theory is that there is one single nested pattern of resemblance linking all organisms’.1 As a result, there has been an attempt to group all life into one phylogenetic or family tree. But the large gaps between many supposed relatives have been a constant headache. As a result, the once simple tree with a single trunk, rooted to a hypothetical 3.5 billion year old, ancient prokaryote, has become a tangled brier (see trees A and B in diagram), causing much frustration and discouragement. But what is the scientific evidence for the involvement of the endosymbiont hypothesis and HT, two main tenets of this new model, in evolution? 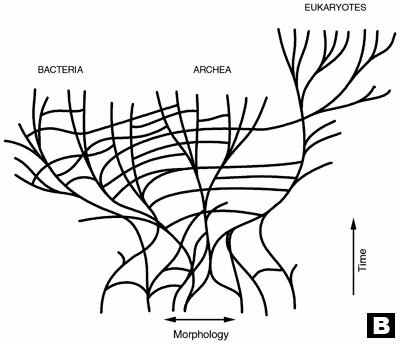 In the original endosymbiont model, an ‘ancient’ eukaryote with a nucleus supposedly evolved from an archaea-like prokaryote. It later engulfed an ancient prokaryote and a cyanobacterium (at separate times) that became mutually advantageous with the eukaryote host and developed into a mitochondrion and a chloroplast, respectively. To try to solve this dilemma, two prominent phylogenetic theorists have proposed that an unknown and now extinct fourth domain of organisms transferred those genes horizontally into the eukaryotic nuclear genome.6 But there is no evidence for such a fourth domain of organisms, and this new idea unfortunately appears to be another ‘just so’ addition to help patch up an ailing hypothesis. Conjugation is used for exchanging plasmids. Plasmids are extrachromosomal, circular DNA molecules that carry not only genes needed for their own replication and transfer, but genes coding for proteins that protect bacteria, e.g. metabolic enzymes that break down toxic chemicals such as polychlorinated biphenyls, antibiotics, etc. The plasmid-containing donor cell uses a pilus, an appendage that attaches to a recipient cell with a pilus receptor, to pull the cells together—some bacteria use chemicals called clumping factors instead of pili. A bridge, or pore, forms between the two cells and a copy of the plasmid is transferred. After transfer, the cells separate. It is possible, although quite rare, to transfer an entire chromosome by this process. Bacteria can also pick up free DNA from their surroundings by transformation. For this to occur, cells must have specialised surface proteins to bind and to internalise the DNA. Transformation, however, is very rare in bacteria. The third mode of exchange—transduction—involves bacterial viruses (bacteriophages). After a virus has injected itself into the host cell, it uses the cell’s DNA replication machinery to make many copies of itself. The cell eventually bursts, and the released virus particles are then able to infect other cells. Normally, viral DNA is packaged into the new virus particles, but sometimes some virus particles instead acquire bacterial host DNA. It is these particles that are used to deliver whole plasmids, as well as pieces of bacterial chromosome, to other bacterial cells. What is overlooked then, is that bacteria live in a variety of environments (such as soil, water and inside plants and animals) and have the growth dynamics and the capability, as single cells, for genetic exchange, which they require to survive and adapt to changes in their environments. This merely shows the in-built, creative design in bacteria that allows them to occupy the bottom of the food cycling chains in a range of ecosystems. But it does not support microbe-to-man evolution. Comparisons of the DNA sequence data from the recently sequenced genomes, which have been determined by testable and repeatable scientific means, conflict with Darwin’s single evolutionary tree of life. As a result, polyphyly, in one sense the opposite of evolution or common ancestry, has been embraced in the form of HT and a community of ancestral cells. This is not surprising, as ReMine predicted that evolutionary ideology is bound to naturalism and simply ‘accommodates’ all evidence to fit reworked evolutionary models, thus showing that it is not falsifiable and therefore not scientific according to science philosopher Carl Popper’s primary criterion.12 He even predicted that evolutionists would increasingly resort to such lateral transfer. 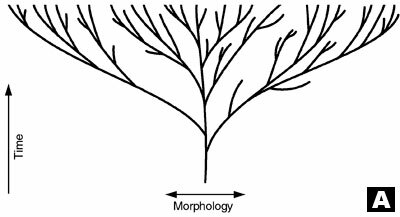 If we tease apart the evolutionary brier and remove the hypothesised evolutionary HT ‘links’ between the branches, we obtain separate trees with individual trunks and roots. This is highly reminiscent of the creationist ‘orchard’, a biblical model for the origin and diversity of all life (see tree C in diagram) which was predicted by the scientific creation movement at its inception.13 In the creationist orchard, the trunk of each tree represents an original created kind or baramin, and the branches correspond to the diversity within a kind due to (limited) speciation, as for example, seen in the dog/wolf/jackal/coyote kind. The creationist orchard agrees with the current genome sequence data, since anatomical, physiological and/or genetic similarities between kinds/baramins do not represent phylogeny but a designer. Evolutionary reasoning, on the other hand, cannot unravel the tangled phylogenetic brier and is unable to understand the true origin and diversity of created life, because its premises of naturalism and materialism axiomatically exclude the original work of a divine Creator. The introduction of HT, the opposite of evolution or common ancestry, into the revised evolutionary model, clearly shows that nested hierarchy/phylogeny was never a prediction of evolutionary theory. Evolutionary theory simply keeps changing its ‘goalposts’ to produce reworked models that suit the current scientific beliefs. Eldredge, N., Do gaps in the fossil record disprove descent with modifications? Creation/Evolution IV:17–19, 1981. Return to text. Jerlström, P., Shaky tree of life, Journal of Creation 13(1):10–11, 1999. Return to text. Woese, C., The universal ancestor, Proc. Nat. Acad. Sci. USA 95:6854–6859, 1998. Return to text. Pennisi, E., Is it time to uproot the tree of life? 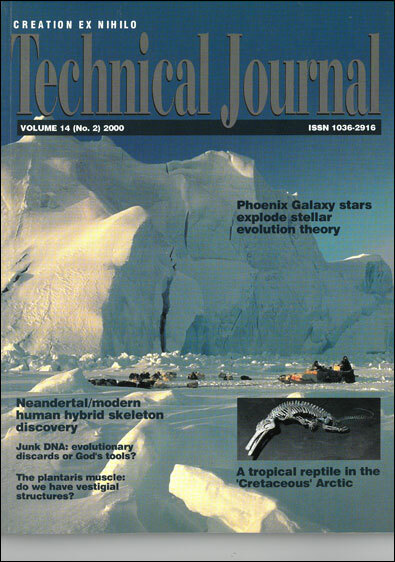 Science 284:1305–1307, 1999. Return to text. Doolittle, W.F., Uprooting the tree of life, Scientific American 282(2):72–77, 2000;p. 77. Return to text. Doolittle, Ref. 5, p. 76. Return to text. Doolittle, W.F., A paradigm gets shifty, Nature 392:15–16, 1998; p. 15. Return to text. Bergman, J., The putative evolution of the animal eukaryote cell ultrastructure, Creation Research Society Quarterly 35(4):221–231, 1999; p. 228. Return to text. Miller, R.V., Bacterial gene swapping in nature, Scientific American 278(1):46–51, 1998. Return to text. Wieland, C., Antibiotic resistance in bacteria, Journal of Creation 8(1):5–6, 1994. Return to text. Doolittle, Ref. 5, p. 77. Return to text. ReMine, W.J., The Biotic Message: Evolution versus Message Theory, St Paul Science, St Paul, Minnesota, 1993. Return to text. Wieland, C., The beak of the finch: evolution in real time, Journal of Creation 9(1):21–24, 1995. Return to text. Wise, K.P., Baraminology: a young-earth creation biosystematic method; in: Walsh, R.E. and Brooks, C.L. (eds), Proceedings of the Second International Conference on Creationism, Creation Science Fellowship, Pittsburgh, Pennsylvania, vol. 2, pp. 345–360, 1990. Return to text.